I was fairly busy this weekend. Let's see....did laundry, cleaned out the "green room" in the basement, grocery shopped, made lemon chicken piccata for Saturday night's dinner (yum), did more laundry, and various other things (see below). 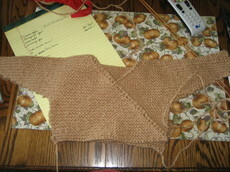 I didn't knit yet. Maybe tonight. 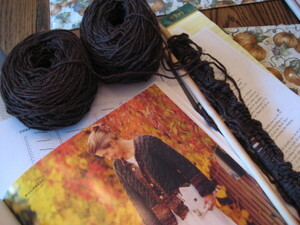 I did catch up on my squares for the Square-Deal WAL. I redid my Windowpane Lace square (on the right), and did the Crossroads for week two (in the middle) and the Fancy Weave square for week three (on the left). 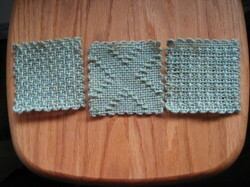 I have the "bonus" square, Basket Weave, for this week yet to do. At least I'm up-to-date for this WAL. 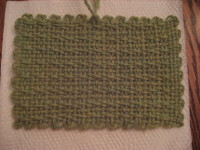 I'm enjoying learning more about weaving patterns. 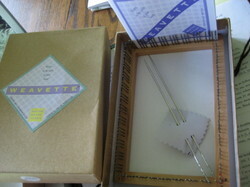 I'm sure a rigid heddle loom is in my future. 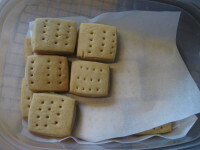 I also made Norma's Very Vanilla Shortbread. I was not on my top performance as a blogger since I only remembered to take photos near the end. So, all you get to see are the less than perfect cookies. I don't have a round cookie cutter, so I just cut the shortbread with my handy-dandy dough scraper scrapper cutter. These cookies are not as elegant as Norma's cookies but just as tasty, I'm sure. (Well, not that I consumed any of Norma's cookies, but, you know what I mean.....right?) The perfect ones are all ready boxed up for DH to take to work so I don't eat the entire batch while I'm teleworking this week. Thank you, Norma! This is the best shortbread cookie recipe, ever. yum I'm definitely going to have to put in the exercise DVD in the player tomorrow for the next century.